Posted by FTR ⋅ August 4, 2009Post a comment Email This Post Print This Post Tweet This! Despite declarations made by some in power, the war in Afghanistan is far from over — in fact, the turbulence is escalating. Seven years after 9/11, the Taliban continue to regroup, attack, and claim influence over most of the region. Invisible History presents a fresh, comprehensive analysis of Afghanistan’s political history that begins at the roots of tribal leadership and ultimately emphasizes our current political moment and the impact of ongoing U.S. military intervention. 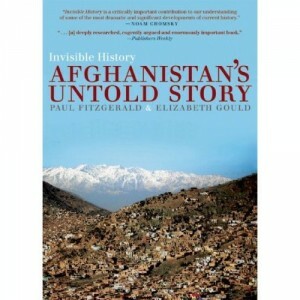 Fitzgerald and Gould tell the real story of how the U.S. came to be in Afghanistan and what we can expect next. PAUL FITZGERALD and ELIZABETH GOULD, a husband and wife team, began their experience in Afghanistan in 1981 for CBS News and produced a documentary, Afghanistan Between Three Worlds, for PBS. In 1983 they returned for ABC Nightline and contributed to the MacNeil/Lehrer News Hour. They have continued to research, write and lecture about Afghanistan history and U.S. foreign policy since. Visit invisiblehistory.com for more information. Afghanistan, a country nearly the size of Texas, is loaded with minerals deposited by the violent collision of the Indian subcontinent with Asia. The U.S. Geological Survey (USGS) began inspecting what mineral resources Afghanistan had after U.S.-led forces drove the Taliban from power in the country in 2004. As it turns out, the Afghanistan Geological Survey staff had kept Soviet geological maps and reports up to 50 years old or more that hinted at a geological gold mine. In 2006, U.S. researchers flew airborne missions to conduct magnetic, gravity and hyperspectral surveys over Afghanistan. The magnetic surveys probed for iron-bearing minerals up to 6 miles (10 kilometers) below the surface, while the gravity surveys tried to identify sediment-filled basins potentially rich in oil and gas. The hyperspectral survey looked at the spectrum of light reflected off rocks to identify the light signatures unique to each mineral. More than 70 percent of the country was mapped in just two months. The surveys verified all the major Soviet finds. Afghanistan may hold 60 million tons of copper, 2.2 billion tons of iron ore, 1.4 million tons of rare earth elements such as lanthanum, cerium and neodymium, and lodes of aluminum, gold, silver, zinc, mercury and lithium. For instance, the Khanneshin carbonatite deposit in Afghanistan’s Helmand province is valued at $89 billion, full as it is with rare earth elements. “Afghanistan is a country that is very, very rich in mineral resources,” Jack Medlin, a geologist and program manager of the U.S. Geological Survey’s Afghanistan project, told Live Science. “We’ve identified the potential for at least 24 world-class mineral deposits.” The scientists’ work was detailed in the Aug. 15 issue of the journal Science. In 2010, the USGS data attracted the attention of the U.S. Department of Defense’s Task Force for Business and Stability Operations (TFBSO), which is entrusted with rebuilding Afghanistan. The task force valued Afghanistan’s mineral resources at $908 billion, while the Afghan government’s estimate is $3 trillion. Over the past four years, USGS and TFBSO have embarked on dozens of excursions in the war zone to collect and analyze mineral samples to confirm the aerial findings. The researchers’ work has helped develop what are essentially treasure maps that let mining companies know what minerals are there, how much is there, and where they are, all to attract bids on the rights to the deposits. The Afghan government has already signed a 30-year, $3 billion contract with the China Metallurgical Group, a state-owned mining enterprise based in Beijing, to exploit the Mes Aynak copper deposit, and awarded mining rights for the country’s biggest iron deposit to a group of Indian state-run and private companies. “These resources provide the potential for Afghanistan to develop its economy, to create jobs and build infrastructure, as it goes into the future,” Medlin said. The mineral riches could lift Afghanistan out of poverty and fight crime and terrorism, said Said Mirzad, co-coordinator of the U.S. Geological Survey’s Afghanistan program. Does Afghanistan’s New Mining Law Benefit Its Mafias? After years of delay, Afghanistan’s parliament finally passed a new mining law, the Law on Mining 2014. On Aug. 16, Afghan President Hamid Karzai signed the law into being. Yet experts say the law lacks safeguards against corruption and is likely to facilitate the creeping control of the sector by armed groups, oligarchs, and monopolies that could threaten the state. According to Afghan, American, and Soviet-era geological studies, Afghanistan has $3 trillion worth of natural resources: petrochemicals account for two-thirds of that total, while minerals, including gold, silver, copper, iron ore, a range of minor metals, and rare earths, marble, and gems account for $1 trillion. The sector has long been promoted as the government’s future revenue stream, and the United States has been touting it for years as the obvious replacement for the military and foreign aid that poured into the country after 2001. At a self-congratulatory ceremony at Kabul’s Intercontinental Hotel the day after Karzai signed the law, ministers lined up to tell assembled guests — including ambassadors and representatives of donor countries — that Afghanistan now has a mining law that conforms to international best practices. Following the lead of the minister for mines and petroleum, Mohammad Akbar Barakzai, they praised its emphasis on transparency, accountability, security, and governance; its respect for the environment and indigenous people. Potential investors, national and international, could have confidence in the efficacy of the law, they said. While the Karzai administration celebrated the law, others expressed concern. The dissenting voice, according to a record of the speeches that I saw, came from a representative of the Extractive Industries Transparency Initiative (EITI), who bravely raised the negative aspects of the new law, including secrecy of contracts. This issue raised alarm bells when the law was in draft form, prompting groups such as EITI, Integrity Watch Afghanistan (IWA), and Global Witness to lobby ministers for changes that would bring the legislation in line with international standards. Global Witness even commissioned a comprehensive study of the draft law, and engaged industry experts to pinpoint weaknesses and make specific recommendations. Transparency, security, and beneficial ownership were among the many areas the ensuing report highlighted as problematic. It is not so clear, however, that Afghanistan can afford to simply tick that box. The Taliban already supplement the tens of millions of dollars they earn annually from opium production with income from illegal marble mining. A report by the U.N. Security Council in June said that Taliban control of onyx marble mining in Helmand province alone earned it at least $10 million a year. Illegal mining in Helmand and Kandahar was enabling some Taliban outfits to become independent of the central command, it said, highlighting a dangerous development. IWA also found that cross-border mafias are thriving as militias such as the ALP — set up in 2010 to fight the Taliban in remote regions — take control of various mines. These groups are expected to soon begin fighting each other to consolidate their positions. This battle for control “may consign the country to a prolonged war,” Javed Noorani, formerly of IWA and an expert on the resources sector, told me recently. So why, Noorani says he wants to know, did the international community back a law that will only benefit a “mining mafia” at a time when Afghanistan is in such desperate need of rule of law and revenues to fund its post-war development?